Interested in exterior siding that looks like wood without the maintenance? Wood look siding options have exploded in popularity over the past five years. With this growth in demand, the number of products offering these features have grown with it. Below we break out the most popular wood look siding options in Edmonton, and some of the new products coming to market. Longboard siding is the product that started Edmonton's infatuation with wood look siding options. Whereas wood and cedar siding were once very popular in Edmonton architecture, they fell out of favour as issues with upkeep and maintenance became prevalent. Then Longboard came along, with a value proposition that Edmonton couldn't resist. The look of their old cedar accents, without the need to re-stain. Made from aluminum and featuring a powder coated finish, Longboard is a truly beautiful siding product. Longboard comes in 24' lengths, and is designed for horizontal and vertical siding, soffit applications, and privacy screens. In terms of performance and aesthetic, Longboard is hard to beat. However, rising costs have made space for lower cost alternatives in the wood look siding space. As for the cost of Longboard siding in Edmonton, you can expect to pay anywhere from $30-40/sqft for supply and install. 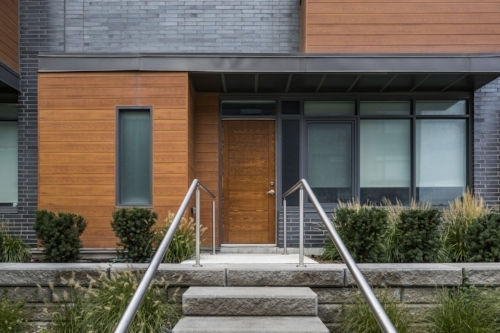 Made locally at Wayne’s Building Products in Edmonton, Lux Architectural Panels have become a very popular wood look siding option in Edmonton. Similar to Longboard, Lux features woodgrain finishes on 4” and 6” panels. The major difference between the two products is the base material - Lux uses steel in place of aluminum for its substrate. Using steel in place of aluminum creates a significant cost savings over Longboard, and while Longboard may be the gold standard, there is no denying the beautiful finish of Lux. Lux Panels can be installed vertically or horizontally, and can also be used as soffit. Because it is manufactured locally, the product is actually cut to measure - reducing waste and added material costs. The cost of Lux Panel siding in Edmonton is usually between $22-$28/sqft supplied and installed. A unique wood look siding option, Sagiper uses heavy gauge corrugated PVC in place of steel or aluminum as its substrate. It is wrapped with a wood grain finish that looks similar to a Longboard or Lux on the wall. Sagiper comes in two lines - Sagiwall, its exterior siding product, and Sagirev, its soffit and interior product. Like Longboard and Lux, it has the option to be installed horizontally or vertically. The cost of Sagiper siding in Edmonton is similar to Lux - a significant savings over Longboard, but still a large increase over more common siding products like Hardie board and vinyl siding. A wood look finish on a very popular substrate, the Earth Tone Series is a custom wood look coating on top of Hardie board. Featuring layers of acrylic paint done to the effect of a wood stain, the Earth Tone Series gives you more flexibility in design with Hardie, and pairs nicely with other products as well. Finished by Vivid Coatings in Acheson, the Earth Tone Series siding line comes with the same finish warranty as Hardie’s own ColorPlus warranty. Because the finish can be done on all Hardie products with a woodgrain texture, the design variety is a little larger than with other wood look siding options. The Earth Tone Series can be done on Hardie Shingle for a cedar shake look, or on Hardie Panel for a variety of design options. While this custom finish is more expensive than traditional Hardie colours, it is a significant discount to other Edmonton wood finish siding options. The Earth Tone Series is less expensive than both Sagiper and Lux. Looking for a quote on one the wood look siding in Edmonton? Reach out to Blue Jay today!